The bleeding heart at its best! 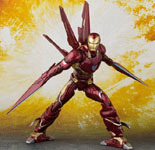 This figure of Iron Man mk 50 comes with the full weapon set that was shown in the movie Avengers: Infinity War. Also comes with special stand for your displaying pleasure. Love Iron Man? Gotta love this figure too!